The reflections sheaf is simplistic and classic in appearance, offering a traditional tribute in whites and greens. Our florists will include white oriental scented lilies, avalanche roses, white eustoma, frilly dianthus. Palm foliages are used to create the backdrop and skirt. A tied sheaf is often chosen for a woodland burial or if the family wish for the flowers to go on to be enjoyed after the funeral service. 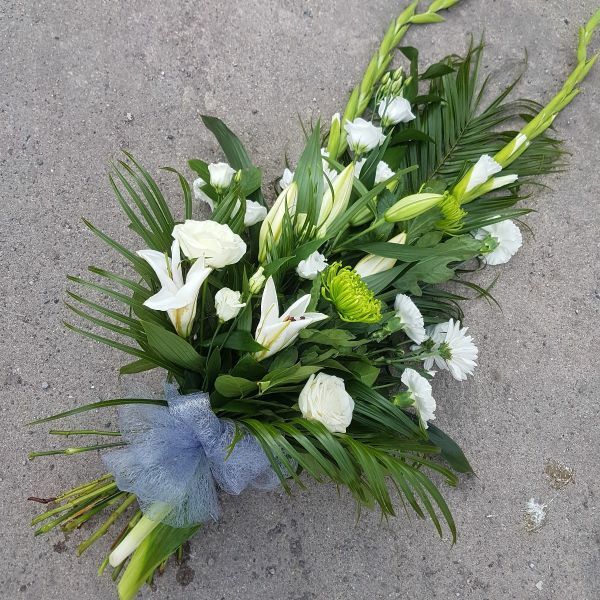 Some offer the flowers to local causes such as Hospices or Care Homes, others wish to take the flowers home which can assist in the gireving process and offer something to focus on in the days after.